City of Niagara Falls and the City of Welland. 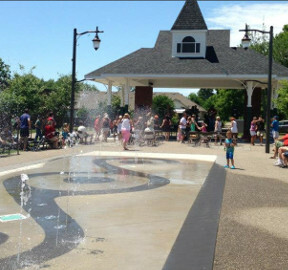 The Village Square was the culmination of a series of infrastructure projects in downtown Ridgeway that involved repaving the road, replacing sewers and watermains, and enhancing the streetscape with new sidewalks, lighting, trees, gazebo and a splashpad. Director of Community and Development Services, Rick Brady, stated “the Ridgeway Village Square is the joint project of Community and Development Services and Infrastructure Services staff. A real team effort to develop a jewel in the heart of Ridgeway”. Mayor Redekop attended the event and noted “Town staff have excelled in the work on this project, which brings a true community feel to downtown Ridgeway. With its train station themed gazebo and water feature, this community meeting spot has enriched the downtown Ridgeway core”. The Town’s Interim CAO, Tom Kuchyt, also attended the event and added “This project represents the most recent investment in public infrastructure in downtown Ridgeway and is a true showcase for Fort Erie”. With the redesigned community area, the connection to the Friendship Trail, part of the Greater Niagara Circle Route and the Trans-Canada Trail System, offers an enhanced and more dynamic area for community festivals and events. The governments of Canada and Ontario each contributed close to $2 million toward the eligible project costs through the Infrastructure Stimulus Fund. What I like, is the tip of the hat to the design of the covered area, a reminder of when Ridgeway had a railway station, We should thank Kim Craitor and Rob Nicholson for getting us cash from the their governments to get this shovel ready project, kick started. Our staff does terrific work when the Council gives them some direction.!! !